When disaster strikes, ShelterBox is typically one of the first on the ground. And this has been the case in the areas suffering from the devastation of Hurricane Matthew. ShelterBox is an international disaster relief charity that provides temporary shelter and life saving supplies to displaced families. 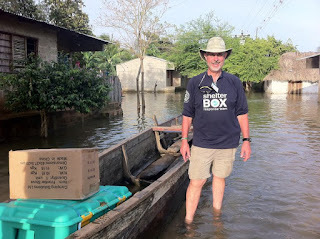 Our Rotary District 6910 ShelterBox Chair, Mike Freeman, asked that this update be shared. ShelterBox USA President Kerri Murray was interviewed by CNN. See the interview here. "ShelterBox is preparing every single day for the worse day ever." - Kerri Murray from the CNN interview. While Hurricane Matthew made landfall elsewhere, Haiti was the worst hit. Haiti is one of the world's poorest countries, and was only just starting to recover from the catastrophic earthquake in 2010. While reports are still coming in about the level of devastation, Hurricane Matthew is the worst storm to make landfall in Haiti for more than 50 years. At its height, the storm had wind speeds of 155 miles per hour. Torrential rains have caused mass floods in many communities. Extensive damage to main bridges and other transport networks has left some parts of Haiti completely cut off, leaving communities extremely vulnerable. Reports are being updated still, but the death toll has surpassed 1000. Reports suggest that more than 330,000 people have been affected by the hurricane. Some areas are still cut off, but officials have said that parts of the south of the country of Haiti have suffered between 90-100% damage. The first cases of cholera have been confirmed and medical facilities are overwhelmed by the amount of people wounded by the hurricane. A ShelterBox response team, including volunteers from the UK, the US and Canada arrived in the capitol of Port-au-Prince on Friday night. They have started to work with contacts in the country, including local Rotary contacts and representatives from IOM (the Organization for Migration) to get data on the affected areas. These Rotary contacts have helped us gain information on some of the areas that have been inaccessible up until now. The team will be carrying out thorough assessments to work out the level of need, as well as the most suitable selection of aid for each community. We already have limited stocks of aid in Haiti and we are working with the Dutch Navy to transport many more stocks from our nearby storage locations. We are exploring every option to get aid to Haiti as quickly as possible. We are also looking at the possibility of partnering with fellow aid agency ACTED who we have worked with on several projects, including our response in Nepal. Working in partnership could give us more flexibility and capacity to reach isolated communities in the country. The team includes Rebecca Swist, who lived and worked in Haiti for six months, and Yi Shun Lai, who took part in the ShelterBox response to the earthquake in Haiti in 2010. They will be able to provide invaluable insight into working in the country. Why does ShelterBox need support? Haiti is one of the world's poorest countries. Many families are incredibly vulnerable and live in shelters made of flimsy materials. Very few of these shelters will have been able to withstand the strongest storm in more than 50 years. While we don't yet have a clear picture of the situation, we expect the devastation to be huge. Torrential rains have caused flooding and landslides, which are likely to bring life threatening illnesses like cholera. We need to be able to send ShelterBox aid to Haiti quickly. We already have stocks of aid in Haiti, as well as on the way. We need people to donate to ShelterBox so that we can send more aid, along with more response teams to reach even the most remote communities to ensure that no family goes without shelter. ShelterBox has worked extensively in Haiti, with the largest response after the 2010 earthquake. ShelterBox played a major role in the provision of tented shelter after the 2010 earthquake, which displaced 1 million people. ShelterBox provided more than 30,000 boxes for that emergency, which represented a third of all tented shelter provided for the displaced families of the earthquake. Because ShelterBox is currently assessing still the best way to respond and the most appropriate aid for the situation, the full scale of the response is not yet known. Therefore, donations cannot be restricted to the Hurricane Matthew response. It is requested that donor support be provided to help provide emergency aid to families affected by the hurricane, support people affected by disaster in numerous other ongoing responses around the world, and enable replacement of exhausted aid supplies. Deployment Essentials or Unrestricted funds would be most appropriate at this time. Social Media - One of the quickest ways to help is by sharing updates with your entire network and encouraging them to share. Please be sure when posting to social media or emailing information to link to ShelterBoxUSA information (not ShelterBox).